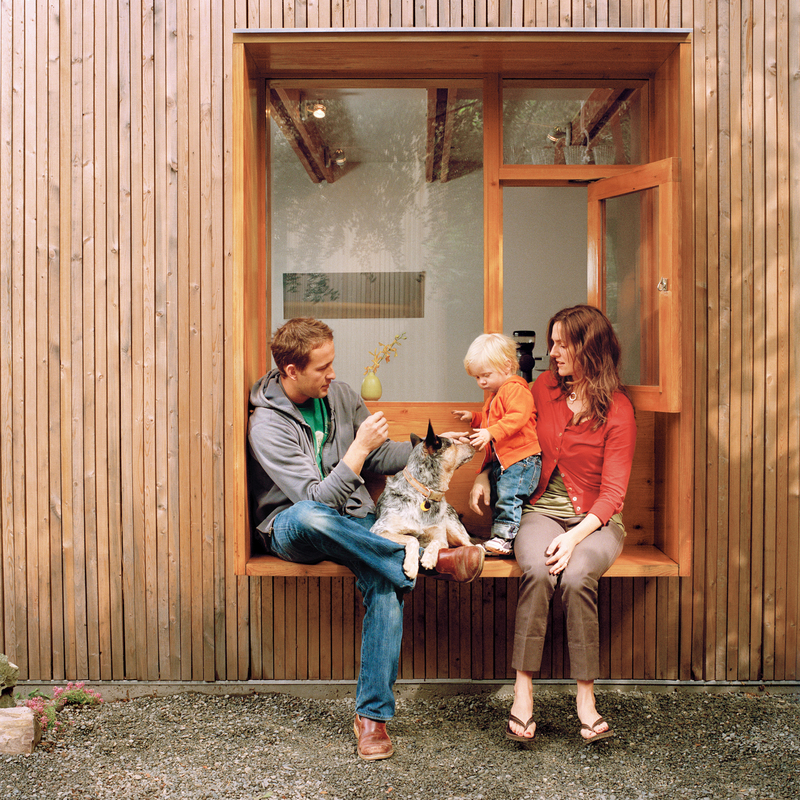 Outside, the couple clad the house with a rain screen of 1.5-by-1.5-inch strips of spruce to create a “modern rustic barn.” The extra-deep sills of the first-floor window become a bench on the outside and a shelf on the inside. Self-proclaimed perfectionists Tolya and Otto “obsessed about making everything” themselves—–from the windows down to the beds. Using simple and easy-to-maintain materials in innovative ways was a guiding principle in the Stonorovs’ design. The bathroom walls are made out of HardiePanel vertical siding, which they also used to clad two of the exterior walls. Tolya and Otto's handiwork, such as the cabinetry in the master bedroom, helps keep the lines of the house clean and the rooms tidy. The Stonorovs couldn’t find a crib they liked and that fit their budget, so Tolya custom-made Niko’s sleeper out of walnut plywood and 3form plastic circles laser-cut by East Bay Laser & Waterjet. Otto made the sliding changing table out of solid walnut. Worried that their dog, Oscar, was feeling neglected, he built a Japanese-style water and food dish for him. The kitchen island—–an equipment stand purchased from online restaurant supplier Serv-U—–is essential in providing much-needed counter space. The bottom shelf creates additional storage and the outlets mounted underneath allow it to become a coffee and toast center. Because it’s stainless steel, the family can put a hot pan right on the surface without worrying about trivets—–which are hard to keep handy in such a small place. The stairway features built-in shelving that's accessible from both sides. Three years ago, Otto and I wanted to start doing more of our own work, so we quit our jobs at big architectural firms and started our own office, Stonorov Workshop. Our first project: Renovate our home. We started in August 2006 but didn’t finish until April 2007. It all took much longer than we expected and we worked on the house nonstop for those eight months, even after I became pregnant with Niko in October. When we opened the walls, you could see straight to the outside. The framing was nonexistent and the floor dipped down a foot in the bathroom; we didn’t know how it was standing. When I pulled the first piece of drywall off the ceiling, rat feces came pouring down on me. It was awful. We had to replace nearly everything, except the upstairs floor, which was one of our few wonderful finds. never put on a trim board, I couldsee a section of the flooring. I looked and said, “Oh my god, that’s wood!” The Pergo flooring came up in half an hour, and we did very little to finish the wood that was underneath. The parts of the house function as very different areas, even though they’re all within the same tiny space. We don’t have a TV, but when we set up our laptop across from the sofa, that becomes the hangout area. When we’re at the table, it’s very much the eating area. Being able to open both doors to the patio makes a big difference in extending the space. We’ve been able to host dinners with six adults without feeling too closed in. The fact that the house is two stories is really important. You walk up the stairs and suddenly you’re in a 16-foot-high space, which makes it feel really big. Upstairs is the bedroom and our quiet space. We fantasize about moving to the country and wanted to have our own little oasis up there, so we placed each window in a way that allows you to see only trees. Niko loves the house. He climbs up the stairs, does laps around the kitchen island, and really likes throwing things out the custom dog door. There are no corners, so it’s pretty kid-proof, but sometimes the energy gets overwhelming with Niko and Oscar both running around and balls all over the floor. That’s when we go for a walk. The only way we can live in 400 square feet is because we thought out each detail and tried to make every space usable when we were designing the renovation. Everything is built in so there’s nothing jutting out into any rooms. We have an inset bookshelf along the stairs with the exact space for our photo albums, cookbooks, and favorite architecture and garden books. We made the window ledges extra deep so we can put our keys and wallets somewhere when we come home. We also have to keep it really clean. When things start getting everywhere, it becomes claustrophobic. It was really important to us as home designers to do the building ourselves. You spend time drawing plumbing and electrical systems and you know in theory how it works but you don’t know how it actually goes together. Now when we draw something, we know the implications of our design and if it’s going to work or not. We won’t live here forever—we will have another kid eventually—but it will transfer into a studio for our firm pretty easily. Working here will be great, and later someone like my mom could live in this house. Overall, it’s pretty perfect for what we’ll want in the future—–we’ll just add another room that way or push it out this way. The only thing I would change is the six-inch-wide concrete kitchen sink. It’s too damn small and if you drop something in it, it’s a goner.